What Are the Most Desired Patterns in Discus? Striking in appearance but delicate in constitution, the vibrant discus fish is a prized addition to the fish enthusiast's aquarium. Named for its characteristic flat shape, the discus fish is delicate and may be a challenge for inexperienced fish keepers. Shy and reserved, this fish originated in the acidic waters of the Amazon River and is known as the "king of the aquarium" due to its appearance and size. According to the North American Discus Association, discus fish are classified by color and may be categorized as either wild, indicating their origin in the Amazon region of South America, or as domestic, meaning that they were bred in captivity. Wild fish can be classified into four classes: Heckle, with three prominent vertical bars including one through the eye; brown with nine characteristic vertical bars that are all the same shade; blue and green, in which red spots are highly prized. The heckle, brown, blue and green discus are also known as classes 1 through 4, respectively. As is true of their wild ancestors, domestic discus fish are classified by physical appearance. The North American Discus Association asserts that collectors of the fish appreciate spotting over a large portion of the fish's body. Class 5 fish are those with thick horizontal lines striping their bodies. They retain the vertical stress bars of their wild ancestors. Turquoise discus are one of the many varieties with these thick striations. Class 6 fish feature fine lines or striations and dots over their gill plates and most have 14 vertical bars. The snakeskin patterned discus is a fish from class 6. Class 7 includes discus fish with complicated patterns and includes the checkerboard, pearl and ring leopard discus. Class 8 is reserved for fish with spots such as the red leopard, domestic red-spotted green and the leopard-spotted snakeskin. Class 9 is an open pattern class, and may include unusual patterns such as the albino spotted or albino snakeskin. Because discus are also sorted by color, classes 10 through 13 are reserved for blue, red, yellow and white fish respectively. 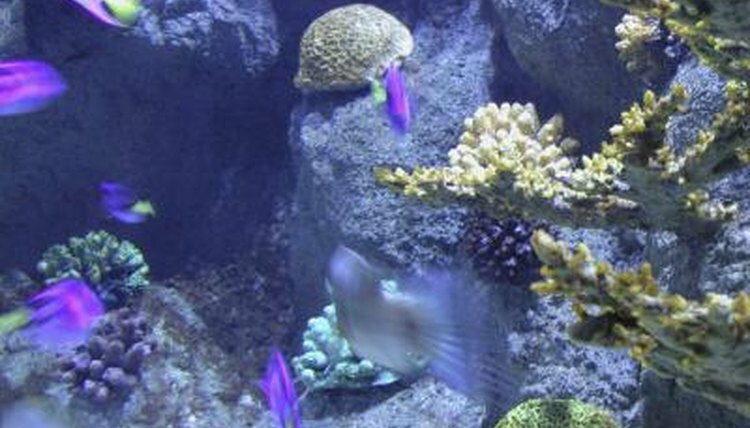 Class 14, an open class, is a category into which any fish that does not easily fit into other classes may be shown, says the North American Discus Association. While discus fish may be available in a pleasing variety of colors, true enthusiasts generally purchase their fish from reputable breeders, or they may breed their own. Pet stores may carry one or two different color varieties. Tony Griffitts for the website Aquaworld Aquarium states that brightly colored discus that are smaller than 3 inches should be avoided. Healthy juvenile discus will not show strong color unless their growth has been stunted, or they have been hormoned, a procedure that causes sterilization. The bright colors on a hormoned discus fish will fade after several months. Aquaworld Aquarium: Discus: "King of the Aquarium"
What Is the Rarest Guppy Type?